The 2012 Honda Pilot offers several noticeable changes for the new model year. The three-row eight-passenger SUV from the Japanese automaker returns for its tenth model year in 2012 with a minor refresh. 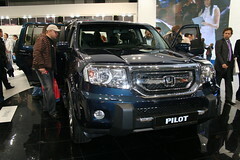 The most apparent change for the Pilot for 2012 is the front end, as it wears a new three-bar grille. The model also offers other exterior, interior and transmission changes for 2012. An updated navigation system and stereo system will be offered and new paint colors and wheel options as well. The Pilot is offered in 8 trim lines with the LX, EX, EX-L, and Touring in different variants. Both two and four-wheel drive trims are offered across the board. The 2012 Pilot LX 2WD has a starting MSRP of $28,470, a $150 increase from 2011. The top line Touring 4WD has a starting MSRP of $40,820. The 2011 Pilot was offered with a 3.5-liter 250 horsepower V-6 engine. This is less power than nearly all of its competitors. The standard five-speed automatic transmission in the 2011 Touring 4WD model returned EPA fuel ratings of 16-mpg city and 22-mpg highway, which was about average for its class. With 2WD, the model is 1 mpg better in both city and highway driving. The Pilot is more fuel-efficient for 2012. While still a five-speed automatic with the same power, thanks to improved aerodynamics, engine friction reduction and new low rolling-resistant tires, the 2012 Pilot 2WD is rated at 18-mpg city and 25-mpg highway. The 4WD is 1 mpg lower in each. This is a 1-mpg city and 2-mpg highway improvement from 2011. The 2012 Pilot also has Honda’s Variable Cylinder Management™ (VCM®) that automatically deactivates and reactivates cylinders, depending on the driver’s needs. This also helps increase fuel economy and lower emissions. This is a positive step for Honda as in recent years they have lagged their competitors in terms of transmission efficiency. Engine displacement is not anticipated to increase. Expect a 2012 Pilot 0-60 time in the 8.5 second range. Which is your favorite three-row crossover for under $35,000?